Being a Lao person, it's always funny to receive the occasional gift that supposedly has some element of Laoness to them. Obviously the person who gave it went through some deep thinking to search out a Lao product which is very thoughtful. 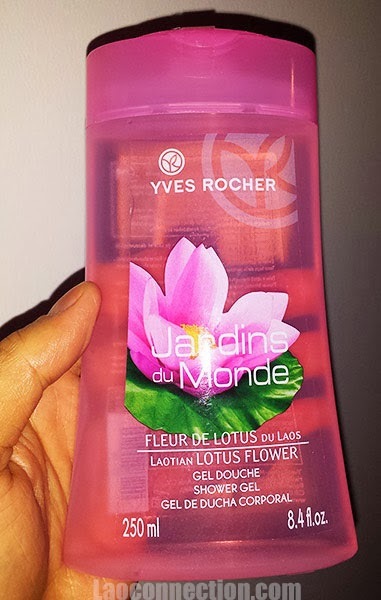 So I recently received a bottle of Yves Rocher Lao Lotus Blossom Shower Gel. It apparently has Lao lotus blossom or at the very least a scent of it. I have used it and it actually does have a nice scent to it that's not overly perfumey. Though I couldn't help but wonder who much actual Lao lotus blossom was in this product, anyhoo here's a picture of it.